What is the 50p tax rate? Our factsheets feature the best articles, the most relevant statistics, and the most up-to-date information to get you clued up on the issues everybody is debating. This briefing focuses upon the 50p tax rate, after Shadow Chancellor Ed Balls pledged to reintroduce the policy at the 2014 Fabians Conference in January. Get briefings delivered straight to your inbox by signing up to updates at the top right of this page. You can also follow us on Twitter or like us on Facebook. The 50p tax rate was first introduced by then Prime Minister Gordon Brown in 2009. It was presented as an emergency response to the sudden crisis in public finances following the financial crash the year before. At the time Yvette Cooper said: “We never expected that we would have this kind of global financial crisis on a scale not seen for almost a century. In those circumstances, what we need to do is to make sure we are being fair." In 2012, George Osborne abolished the 50p tax rate. He argued that it was not raising enough money to justify its existence. He balanced the measure out with tax breaks for the lowest earners as well. 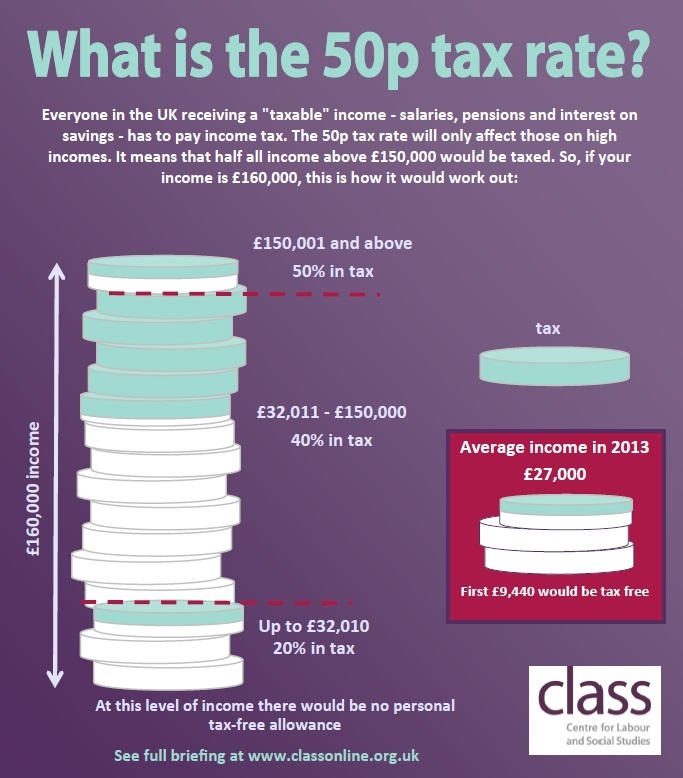 So what exactly is the 50p tax rate? Will the 50p tax rate raise money? First, the IFS emphasises that there is a lot of uncertainty around HMRC figures – so the tax may well generate more than the £100m the department has put forward. Second, the “change in behaviour” the IFS mentions may be a reference to tax avoidance. In which case, there is a strong argument that says the government should clamp down on tax avoidance rather than shying away from introducing the 50p tax rate. Finally, when the 50p tax rate was introduced by Gordon Brown, George Osborne conceded it had raised £1bn (and had the potential to raise much more). This £1bn, though small, could cover the cost of a number of cuts affecting the very poorest, including the bedroom tax, legal aid cuts, and the 1% cap on benefit increases – each of which have saved significantly less than £1bn. You can read more about that here. According to HMRC figures released in January 2013, 236,000 people are affected by the tax. Why does the Labour Party want to introduce the 50p tax rate? The 50p tax rate seems to be a signature policy for the party, in the sense that it makes a statement about Labour’s values of equality; part of which is a progressive tax system. It is coupled with similar Labour policies, such as a bankers’ bonus tax and a mansion tax. Having said all this, Ed Balls has also said the policy is merely a means of bringing the deficit down, and will be temporary. A YouGov poll for the Times found that 61% of people support the policy. What are the criticisms of the 50p tax rate? There are two main themes of criticism. The first is that the tax won’t raise much money, which is what Treasury minister David Gauke said earlier this week. The second is that the tax is bad for the economy. Many businesspeople have accused the Labour Party of being “anti-business.” Richard Longdon, chief executive of Aveva, the Cambridge-based software company, said: “The real issue with the Labour proposal is the signal it sends, in that taxing the better off is fair game and leaves people wondering what next?” Ed Miliband has been accused of alienating businesses in the run-up to 2015. Moreover, some critics have suggested that the tax will cause high earners to relocate from the UK and take their money with them (there is very little evidence that this happens in practice and you can read about that here). However, the criticism of the policy does seem milder than in 2009, where Gordon Brown was accused of class war, playing politics, and alienating ordinary middle-class voters –perhaps those criticisms reveal a shift in politics over the last 5 years, if journalists and politicians now concede that ordinary middle-class voters are not earning over £150,000. Tags: deficit, economic alternative, equality, fair economy, politics, progressive taxation.